- Marriage Jubilee of eight couples – Golden Jubilee for one couple and Silver Jubilee for seven. Fr Dominic Gomes, Vicar General of the Archdiocese of Calcutta was the main celebrant at the 3.30 pm Holy Eucharist in a packed church. Along with him were Fr John Chalil, Parish Priest, Fr Ujjol Mondol – Assistant Parish Priest, Fr C.J. Sebastian, Fr Andrew (UK) and priests of Mother Teresa. In his homily Fr Dominic showcased the various programmes held in Kolkata to celebrate Mother Teresa’s Sainthood. He congratulated the Missionaries of Charity nuns present at the Eucharist and urged Auxilium parishioners to imbibe Mother’s spirit of love and service. He blessed the life-size statue of St Teresa of Calcutta, donated by the golden jubilee couples Julius and Juliana Bage and went up to the jubilarian couples to congratulate and bless them. After the Eucharist which was enlivened by the English, Bengali and Hindi Choirs, a procession began with the statue of St Teresa of Calcutta around the roads of Auxilium Parish, led by two full-throated Kirtan groups from Kathgola (women) and No. 3 Bridge (men). While Fr Dominic carried the Blessed Sacrament on a Matador, nuns from Missionaries of Charity, Holy Cross, Sister Adorers, Navjeevan and FMA walked with parishioners in prayer and songs. The procession came to a fitting end at 6.40 pm with a Benediction. After a short tea break, Jubilee Cake was cut and the jubilarian couples were felicitated by Fr John and Fr Dominic with garlands, gifts and special rosaries. The nimble-footed parish children and youth put up lovely dance performances to impress the jubilarian couples. Fr John thanked Fr Dominic for having spared his valuable time. Fr Dominic complimented all for the well-organised Eucharist and particularly the procession and the cooperation of the local people. The Archdiocese of Calcutta and Missionaries of Charity, in collaboration with Catholic Association of Bengal, organized a special programme, on Sunday 23rd October 2016 evening, to honour Mother Teresa on her being declared worldwide as “St. Teresa of Calcutta”. It was two hours of pristine Musical Tribute on the grounds of St. Xavier’s College in partnership with the Peerless Group. The galaxy of stars were Missionaries of Charity girls, Holy Child School, Julien Day School, Kala Hriday, all the six Schools and TTC of Loreto Kolkata, Don Bosco Park Circus School and the Archdiocesan Choir led by Dilip Rozario. The icing on the cake was very short two-song performances by the one and only Usha Uthup and effervescent Shayne Harapriet. The boys of Don Bosco Park Circus, started with a Michael Jackson song “Heal the World.” Then they sang “carry a candle on to the darkness, hold out your candle for all to see.” They mixed their musical with a high-class short play on Mother’s dedication to the have-nots, her overcoming challenges and criticism with love, and the various national & international awards she received. They ended with the song “I will always love you”. Mrs Chatterton and Mr Anupam Banerjee, teacher, deserve kudos for training their boys for the D-Day. The 120+ girls from six Loreto schools put up a sterling performance on the life of Mother Teresa, her service with a smile, her awards, depiction of Monica Besra and other miracles attributed to Mother Teresa leading to her sainthood. What took everyone’s breath away was a 25-minute dance performance by “Dancing Jesuit” Fr George Saju’s team from Kala Hriday. It was unalloyed Indian Classical music where Sarod and percussion stood out, complemented by superb choreography by Ms Gloria Megha Gomes and Satyen. The rich intonation of the lyrics described Mother Teresa as the Solace to the destitute of Kolkata and the world, the helpless and shelterless women, lepers of Titagarh and orphaned children of Shishu Bhavan. In keeping with Kolkata’s heritage and unwavering love for Indian Classical Music, it was a fitting tribute to Kolkata and Mother Teresa. The last item was Bishwa Jana Janani by Archdiocesan Choir Master Dilip Rozario’s Bengali and Hindi group depicting mother’s life of service, devotion and love. The organizers and donors deserve all the praise for the memorable musical evening and for the wonderful backdrop, stage, sound and light arrangements. A thoroughly enjoyable evening in the memory of the most Blessed St. Teresa of Kolkata. 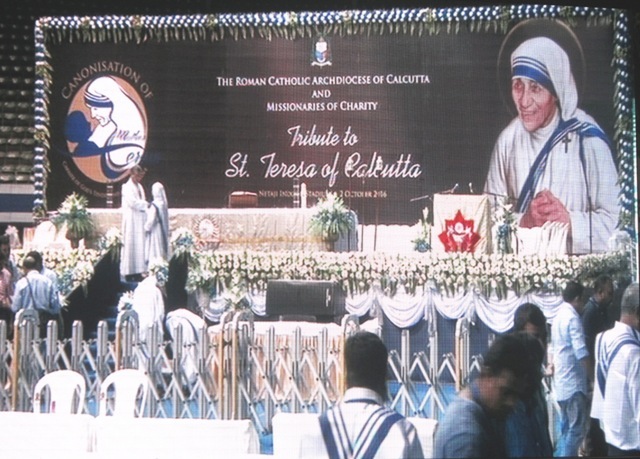 2nd October 2016, 3 pm: Netaji Indoor Stadium Kolkata: It was at this memorable venue the Archdiocese of Calcutta and the Missionaries of Charity organised a Thanksgiving Eucharist to profoundly thank the Almighty for the Crowning Glory of Sainthood on Mother Teresa of Calcutta. Today coincides with the birthday of Mahatma Gandhi, a messenger of peace. Both International Icons are Indians – Gandhi by birth and Mother by choice to dedicate her life for the poor and the marginalized. It was very solemn and yet moving Eucharist with the Apostolic Nuncio Salvatore Pennacchio being the Main Celebrant along with 3 Cardinals (Cardinals Telesphore Toppo, Baselios Cleemis and George Allencherry), 49 Archbishops and Bishops and a large number of priests. The Eucharist began with a sprightly welcome dance by nimble-footed young girls wearing traditional costumes and delicately balancing earthen pots on their heads. 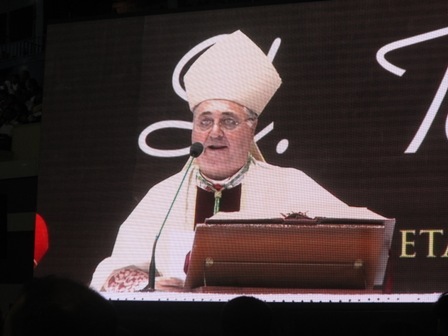 The 10000 plus audience got instantly involved, thanks to the crisp introduction by Archbishop Thomas D’Souza, and a very touching homily by the Nuncio. The well-oiled choir brought life to the Holy Eucharist and it was only fitting that all the Choirmasters were handsomely praised for their painstaking efforts. After the Mass, there was a 15-minute break. At 5.15 pm the audience stood up to welcome the the Chief Guest Vice President Mr Hamid Ansari, his wife and the Guest of Honour, Mr K.N. Tripathi, the Governor of West Bengal, to the accompaniment of the National Anthem. They were felicitated by the Archbishop and Sr Prema Superior General of Missionaries of Charity. Then, TMC Rajyasabha MP Mr Derek O'Brien said that Sr Prema and her MC sisters are wonderful people. He also mentioned that the Nuncio could make very good coffee and got a statue of Mother Teresa installed in his Delhi garden two years ahead of Kolkata, before Mother was declared a saint. After this the Vice President Mr Hamid Ansari waxed eloquent on the Mother. He said when Mr Derek invited him to be the Chief Guest at today's civic function, he readily accepted. He described Mother Teresa as a Talisman of Compassion, love and care. Her love for the needy, the sick and the downtrodden was boundless, cutting across caste, creed and religious divide. He recalled what the Mother said "What the poor need most is to feel needed, to feel loved. There are remedies and treatments for all kinds of illnesses, but when someone is undesirable, if there are no serving hands and loving hearts, there is no hope for a true cure". From a humble beginning with 12 nuns, the Missionaries of Charity now has 5500 nuns and volunteers spread over 139 countries. Mother's simplicity and utmost humility is what truly exemplifies her as a true Indian. Sister Prema thanked Kolkatans for their wonderful spirit. She recollected 19 years ago, the same venue had bade a tearful farewell to Mother Teresa. And today Kolkatans gathered to give thanks to the Lord for crowning Mother Teresa with sainthood. She thanked all the dignitaries and Chief Minister Ms Mamata Banerjee and her Government for unstinted support to make the Canonisation Celebration a success. She had special words of thanks for Archbishop Thomas D'Souza and his members of the Core Committee. She ended: "Indeed we have much to thank God for." There was a short cultural programme by girls from St Xavier’s College and from Mother Teresa’s centre. Calcutta Youth Choir also put up a couple of songs. 26th August 2016 Kolkata the City of Joy witnessed two events. The first took place at 6 am at the Mother House where in the presence of a large contingent of Press Photographers, a Holy Eucharist was celebrated to commemorate the Birthday of Blessed Mother Teresa of Calcutta, who is going to be canonized in Rome on 4th September 2016 as Saint Mother Teresa of Calcutta. In his homily, the Archbishop said the Mass was offered to commemorate the 107th Birthday of Mother Teresa and also to pray for children, especially for Mamta and Shilpi who were going to Italy for adoption. His homily was on Wisdom and Foolishness based on the parable of 5 wise virgins. He said wisdom consisted not in proclaiming the Gospel of Jesus Christ in lofty words but in telling the world of the power of Jesus crucified. He mentioned of Pope Francis’ visit to World War II Concentration Camp in Poland where the Germans in their smallness of mind put to death more than one million Jews - that was foolishness. His Grace said that we must thank the Lord for having given us the gift of life and the Mother. Her life was a mission to proclaim the Good News of Jesus who said “I am the way, the Truth and the Light.” Renunciation, asceticism and sacrifice were the hallmarks of Mother Teresa who emulating Jesus on the Cross, dedicated her life in the service of others. All of us are called to share our lives for others whether we are priests, religious or people having families. That is God’s wisdom of life for us. That is why mother chose the name Missionaries of Charity - for love involves charity, sharing and sacrifice. He mentioned an anecdote where the Mother gave a short speech in Bengali. There was pin-drop silence in the large gathering and all listened with rapt attention. One priest whispered “We say the same thing but nobody listens! “ Mother’s life was a message. In passing, the Archbishop said that it was his birthday too. What a pleasant coincidence! 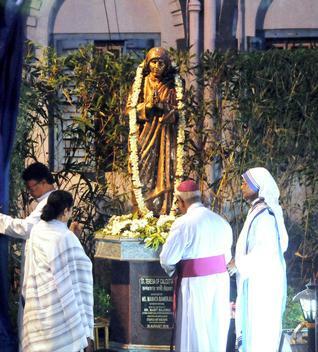 The second event was at the Archbishop’s House in the evening, where in a closed ceremony, West Bengal Chief Minister Mamata Banerjee, unveiled a 5.2 feet tall bronze statue of Blessed Mother Teresa, along with the birthday boy Archbishop Thomas D’Souza and sister Lysa, Assistant General of Missionaries of Charity. The statue has been donated by industrialist and philanthropist, Mr Namit Bajoria who is the Designate Honorary Consul of Republic of Macedonia in Kolkata. It was a rare event because the statue was erected just beside that of St John Paul II who on 19th October 2003 had declared the Mother “Blessed Mother Teresa of Calcutta” when he was the Pope. What a turn of events for the Mother who destined by God travelled miles from her birth place Macedonia (Skopje) to do her missionary work in the dingy slums of Motijheel, Kolkata. Even before she is being canonized as “St Teresa of Calcutta” on 4th September 2016, to the world she is already famous as the “Saint of the Gutters”. 30th June 10 am St Thomas Parish, Middleton Row, Kolkata was the venue for the funeral mass of Archbishop Emeritus Henry Sebastian D'Souza. Cardinal Telesphore Placidus Toppo led the Eucharist concelebrated by 14 prelates. As the church was packed to capacity, many devotees who thronged St Thomas Church were accommodated in the Loreto House AC hall, where a video screen was put up to catch up with the proceedings. Fr. Dominic Gomes, Vicar General, read out the life sketch of Archbishop Emeritus Henry D’Souza, in particular the milestones during his long years of pastoral service as Bishop of Cuttack-Bhubaneswar and then as Archbishop of Calcutta (All reports said that the Archbishop was born in Calcutta whereas the says he was born in Igatpuri, a town and hill station in Nasik). 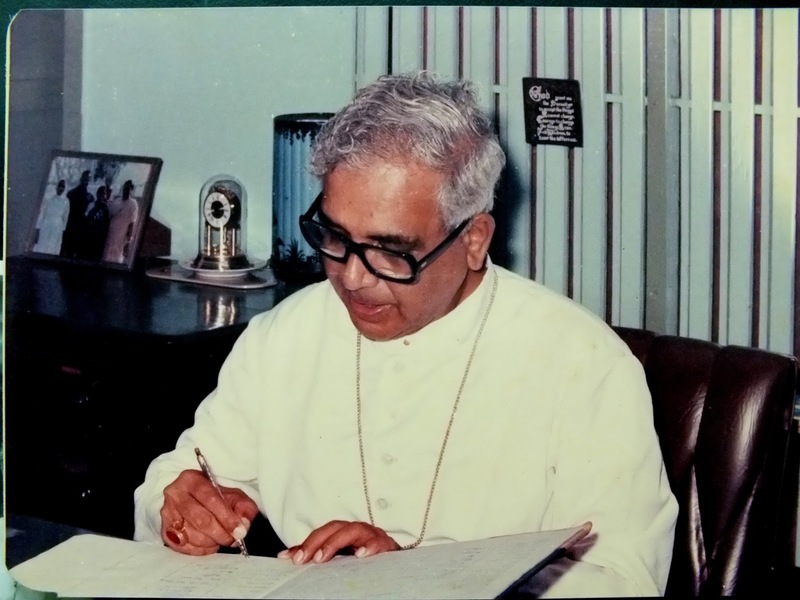 Archbishop Thomas D’Souza in his homily read out a message from His Holiness Pope Francis who expressed his condolence for the demise of Archbishop Emeritus Henry D’Souza. He said: “And let us pray for those in the clergy, religious and lay faithful of the Archdiocese of Calcutta.” In his message His Holiness joined the faithful gathered in giving thanks to God for the years of pastoral service which Archbishop Henry D’Souza gave to the church in Calcutta and prayed for the repose of his soul. To all present he imparted his cordial blessing as a pledge of consolation and hope in the Risen Lord. The Archbishop’s tenor was one of thanksgiving and making an effort to emulate the good work of the late prelate. Bishop Monis Cyprian of Asansol Diocese expressed profound gratitude to his mentor Henry for all his success. He narrated how Calcutta Archdiocese was bifurcated and Asansol Diocese carved out, with him being installed Bishop on 12th March 1998. There were several speakers including the late Archbishop’s brother & niece and Derek O’Brien Rajya Sabha MP who shared their fond memories of the late Archbishop Henry D’Souza. The sedate choir of the Missionaries of Charity sisters caught everyone's attention – it was simply sublime. The Bengali choir too sang very well. Among the 14 prelates, including Archbishops Abraham Viruthakulangara of Nagpur and John Barwa of Cuttack-Bhubaneswar, Monsignor Joseph Chinnayyan Deputy Secretary General of CBCI, and scores of priests and nuns who bid farewell to the founder and former President of Conference of Catholic Bishops of India (CCBI), was Mother Teresa’s Spiritual Adviser Fr Rosario Stroscio (Auxilium Parish) who on 18th May celebrated his 95th birthday. Fr Rodney Borneo of the Young Brigade conducted the proceedings admirably. On 27 Jun 2016, he passed away to meet his maker at his heavenly abode. It is tragic news that Ms. Judith D’Souza, who belongs to Fatima shrine Parish, Kolkata, working with an international NGO, was kidnapped in Kabul few nights ago. She is an employee of the Aga Khan Development Network; all efforts are being made by the Afghan officials to secure her release. She has been in Kabul for a year and was to come home to Kolkata on June 15. Foreign Minister Sushma Swaraj has spoken to her family. In response to a tweet from her brother, the Minister said that the Central Government is "doing everything to rescue her." Kindly pray for the release of Ms. Judith D’Souza as early as possible. On 16th & 17th April, 2016 from 8.30 am to 6 p.m. the Church of Our Lady of Happy Voyage Howrah welcomed around 1000 – 1200 Catholics and non- Catholics from Kolkata and other nearby districts thirsting to listen to the Word Of God. Father Victor David, Parish Priest welcomed renowned preacher sister Falguni Faustina a woman born in a Hindu family baptized to Christianity 6 years ago and anointed by the Holy Spirit who renounced everything for the sake of preaching God’s kingdom and his love to humanity. She was accompanied by renowned praise and worship gospel singer brother Lijo Thalakkottoor who mesmerized the crowd into deep spiritual gospel songs, both of them are from Divine Retreat Centre, Kerala. Sister Falguni has conducted many retreats at various parishes in the Archdiocese of Kolkata. The retreat was a great boon to experience the power of the Risen Lord in life. Being the Year of Mercy Sister Falguni spoke on the importance of God’s Mercy and compassion for his children. She shared her personal experience with testimonies to make the Word of God very relevant in the lives of Christian community. Besides breaking the Word of God and spelling out the purpose of the retreat based on scripture and sacramental life. Biblical references was drawn from prophets Jeremiah chapter 29: 11, Isiah 43:18-19, Esekiel 18:31, the book of . Psalms 56:18-19. The Gospel of Mathew 13:3-4, Mark 2 :22. Mathew 13:31-33 etc. The special features of the retreat were confessions, healing and anointing of every faithful who participated in these two days in prayer and constant seeking the love of God in life. All sang the praises of God and thanked God for his love and bountiful mercy. Father Victor thanked the parish council members for organizing the retreat and also thanked the youth for giving a helping hand as volunteers. As a token of appreciation and gratitude gifts were given to sister Falguni and brother Jijo with bouquet of flowers. A vote of thanks was given by Mr Raymond Baptist Secretary of the parish council. -Our Lady of Lourdes Barasat (12). Total turnout was 37 including a new PMT member from Auxilium Parish PMT. At the outset, Farrell Shah, Social Communications Director, made it clear that the programme was not a journalism course but was meant to attune Parish Media Teams (PMTs) with the communication norms of the Archdiocese of Calcutta and to equip them for reporting in the Herald and other archdiocesan media including the website archdioceseofcalcutta.in. Also, by the end of the programme they would have the skills to start and run their own parish paper as the first of their PMT activities. Fr Devraj Fernandes, Editor of The Herald, and a key resource person, said the heart of the Church is communication. The Church’s mission is to communicate the good news and values through the technologies available. As an example he cited Pope Francis who is using the latest means of communication, such as Twitter and Instagram. He said that in a parish communication, interaction with parishioners is very important. A short video on good teamwork/communication was shown, followed by a brief interaction on the need for PMTs. Fr Dominic Gomes, Vicar General, said Communication is the lifeline and has to be in synchronization with the Archdiocesan Pastoral Plan which touches human lives. Reading, writing and listening were the three key skills of communication which culminates in World Communication Day on Sunday 8th May. Farrell spoke on the various media options available (News Wall, Newsletters and papers, Email, Flyers, Blogs, websites and social networks Twitter and Facebook). He also spoke on Creating Parish-relevant Content, Team Skills and Techniques Required for Parish Newsletters, which should follow the PREPS method - Photography, Recognition, Events, Prayer Life and Show Case - to be interesting to the parishioners. Sample newsletters Voice of St Mary's (St. Mary’s Ripon Street), Wellspring (Our Lady of Vailankanni), Kingdom (Christ the King) and Auxilium Speaks were shown, their styles and common points dissected. Anatomy of a parish paper, the three components i.e. 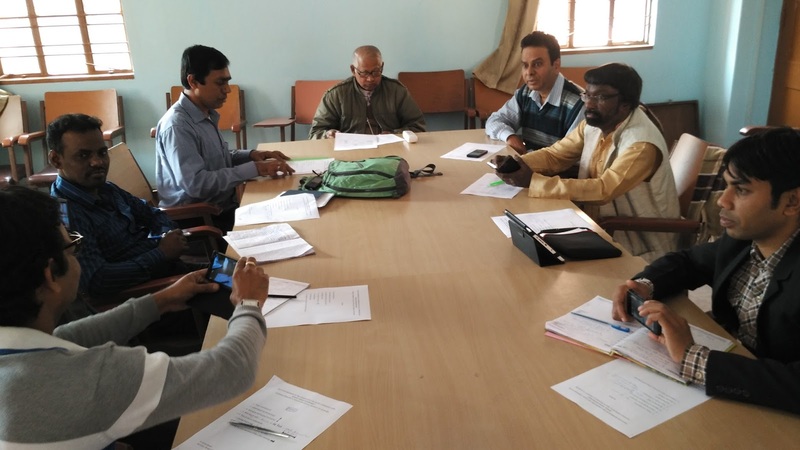 (1) Content Creators (reporters, photographers, designers and editors (2) Fund Raisers (Advertisement and Donor mobilisers) and (3) Co-ordinators (for follow up with printers and on circulation and sale of newsletters) and self-financing of parish newsletters were also discussed. The programme ended with each PMT producing on-the-spot newsletters complete with layout, mastheads, newsletter name, logos and short reports. They also shared their plans for self- funding their publications. Each unit described its newborn newsletter, promising the maiden launch in their respective parishes on 8th May 2016, World Communication Day! Sunil Lucas shared deep insights from his treasure trove on correct communication especially cautioning on not to be swayed by social media chain messages / hypes (e.g. rumour on Pope's visit to India this October). 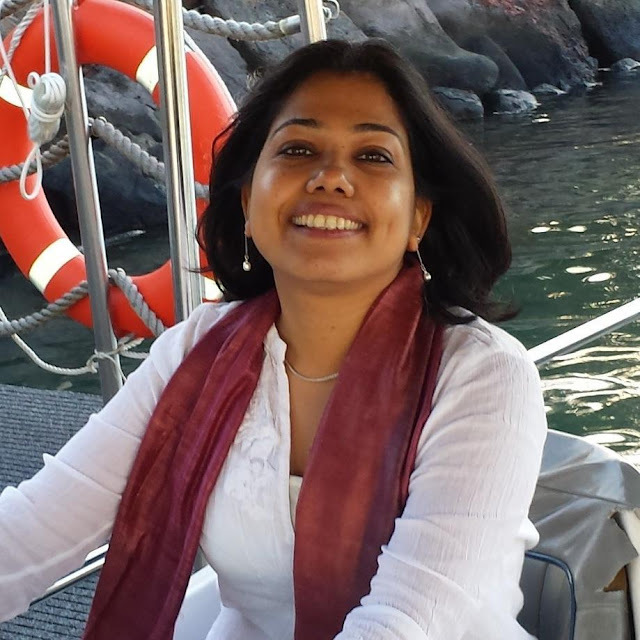 Althea Phillips, Times of India professional, went round to each PMT and gave valuable tips. Angelina Jasnani sponsored the lunch! 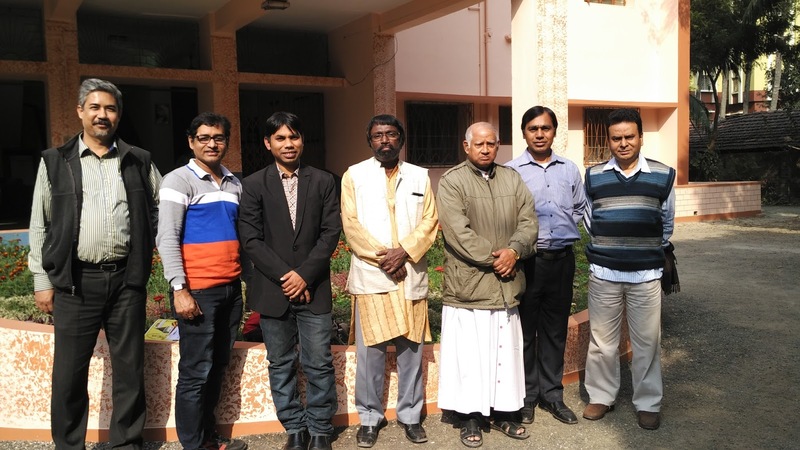 The diocesan directors and secretaries of Social Communication of the Bengal-Sikkim Region (CSC-BSR) met February 4, 2015, at Proggaloy, Barasat. Chaired by Bishop Joseph Soren Gomes of Krishnagar, the meeting discussed the various training needs of dioceses, fundraising for regional activities, the upcoming World Communications Day celebrations and also initiatives for the Year of Mercy. One of the initiatives for the Year of Mercy would be releasing a Bengali version of the song for the Holy Year online. A video version would be made available on the website of every diocese in the refion. A course for the clergy - Proclamation in the New Age, was also discussed, and would be given shape soon. This love story culminates in the incarnation of God’s Son. In Christ, the Father pours forth his boundless mercy even to making him “mercy incarnate” (Misericordiae Vultus, 8). As a man, Jesus of Nazareth is a true son of Israel; he embodies that perfect hearing required of every Jew by the Shema, which today too is the heart of God’s covenant with Israel: “Hear, O Israel: The Lord our God is one Lord; and you shall love the Lord your God with all your heart, and with all your soul, and with all your might” (Dt6:4-5). As the Son of God, he is the Bridegroom who does everything to win over the love of his bride, to whom he is bound by an unconditional love which becomes visible in the eternal wedding feast.